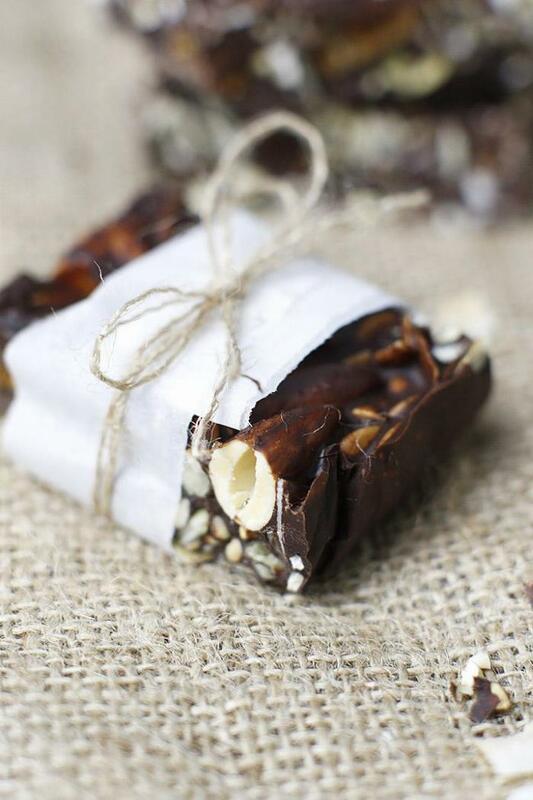 A homemade chocolate bark made with crunchy nuts, seeds, coconut and chewy figs. Perfect for serving at parties and gifting for holidays! 1Line a small 5x5 baking dish or medium sized plate with parchment paper and spray with coconut oil. 2Break chocolate up into small pieces and add coconut oil to a medium bowl. Use a double boiler to melt chocolate, or use microwave (stirring every 10-20 seconds). Stir often until smooth. Set aside. 3Add next 5 ingredients to melted chocolate (everything except the brown rice syrup and salt) and stir until combined. Mixture will be very chunky and be loaded with trail mix (this is good!). Spoon into dish or on plate, then flatten. 4Sprinkle with salt and spoon/drizzle syrup over chocolate. Slightly mix/press syrup in, but don't need to combine. Press chocolate flat with backside of spatula until packed. Should be 1 1/2 inch or so thick. 5Place in freezer until set, 30 min or until hard. When ready, pull up on parchment and transfer to cutting board. Cut into small squares. 6Store in refrigerator or freezer. *Use 80% for rich chocolate bark, or 70% for a little sweeter chocolate. I really like using half and half (80% and 70%). *Make with raw buckwheat groats, not the toasted kasha groats. Raw groats are lighter in color.